II JK Luftlageübermittlung, day-fighter and fighter bomber control spring 1945. The Invasion put all Wehrmacht forces in France into retreat incl. the units of the Ln-Dienst. The Stellungen and HQ were overrun, most facilities and equipment were static and had to be destroyed. The HQs performed an orderly withdrawal sometimes to prepared alternate HQs (Ausweich GefStds) fully prepared with telephone exchanges and landline connectivity. 4 JD and Jafü Süd Frankreich were disbanded and II JK retreated to the Flammersfeld area. When the retreat started, it was realized, that the static part of the Ln-Dienst gradually would be lost, and a new type of unit was established/revived the: Flugmelde Funk Abteilungen (Flugm. Funk Abt. ), formations, which based their reporting on visual and aural observations, and did not rely on landlines to pass their reports, but used radio solely. Their primary function was to report to the GefStd of the Jagdgeschwader (JG) and Flak Divisionen, but in addition a consolidated air picture was also compiled in the Auswertung of the Flugm. Funk Abt. Based on the Luftlage thus compiled at the JG, fighter control (Adler-Verfahren) was performed form the GefStd of the JG. 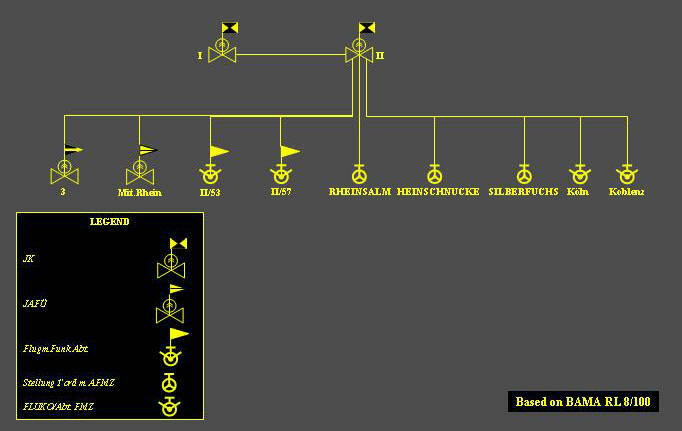 Initially 5 Kompanie were formed in France, but by the time the JK had retreated into Germany, the organization of the Ln-Dienst subordinate to II JK was a shown below. 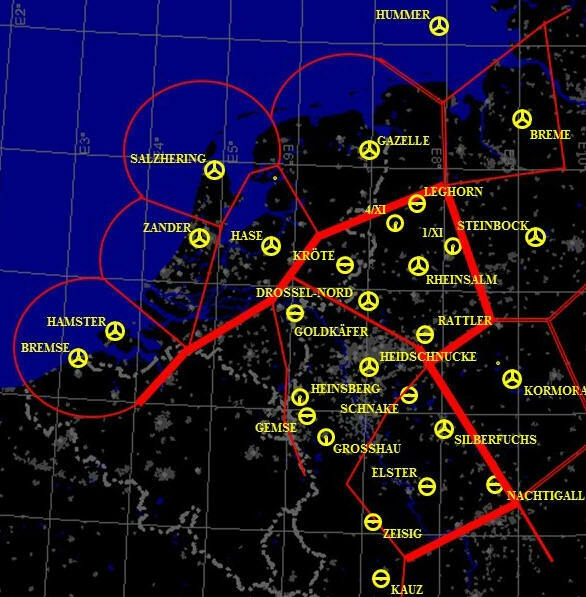 Also II JK changed it's role as part of the strategic air defence, to one of a mixture of defence against allied tactical air power, protection of the Luftwaffe airfields in Western Germany and navigational support to offensive units. Flugmelde and Jägerleit Stellungen in II JK area of interest JAN 1945. Click map to enlarge. Organization of Ln. units subordinate to II JK spring 1945 Table of organization for Flugm.Funk Kp. Luftlageübermittlung in II JK area of interest. The consequent Area of Responsibility. After "Wacht am Rhein" had turned into "Retreat to the Rhein" after New Year 1945, the allies started an intensive interdiction campaign in the rear area of the German formations. There was a division of responsibility as depicted on the above map. This resulted in heavy activity by allied tactical air power west of the Rhein. The German response is described below. On the Flugmelde- and Jägerleit-Stellung map above it is noteworthy that only 4 Jägerleit Stellung are available. 3 Equipped with Y-Linien only (TEEROSE II, VOGELBEERE and HERA) and one equipped with Freya-EGON and Y-Linien (NELKE). It is unknown to what extend the GefStd of II JK at this point was able to perform Y-Verfahren and the effectiveness against fighter bombers at low level was probably also doubtful, due to the limited coverage. And apparently this threat was of serious magnitude. All airfields were thus equipped with a Freya for local early warning in mid January 1945. It was further decided to assign Jägerleit Offiziere, in order to control day fighters, to Flugmeldemess Stellungen 1'ord, as follows: 1 from JG 2 to DACHS, 1 from JG 26 to HEIDSCHNUCKE and 1 from JG 27 to RHEINSALM. Each JG and hence Stellung was assigned a specific area of responsibility. 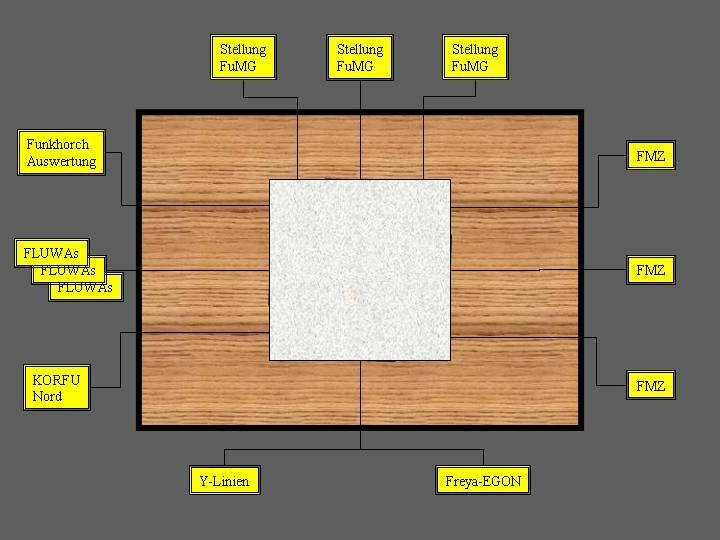 The control was performed from a Fluma II Tisch (Klotzsche-Tisch) on which information was plotted as depicted below. The Fluma-Tisch and the sources providing information. A very proficient Filter Offizier was required in order to turn this avalanche of mutually supplementary and contradicting information into a sensible Luftlage. One must hope that such an individual was provided to the rather inexperienced Jägerleit Offizier. The position of the fighter formation was based on tracking by and reporting from a Freya-EGON or a Y-Linien. 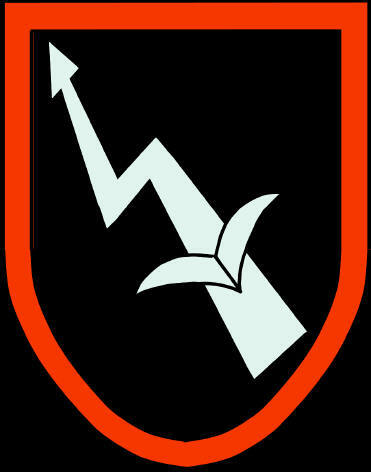 JG 2, JG 26 and JG 27 were each assigned a Jagdraum as depicted on the map below, and they were assigned a Jägerleit Stellung as described above. This Concept of Operation reflects a violation of the principles for the application of air power and shackles the true potential of the forces available. One of air power's virtues is it's flexibility. When the force is "parceled out", as it was in this case, and the units are tied to a specific area, maximum force could not be brought to bear on an allied intrusion. It is a pitfall that many countries have fallen into each and every time with disastrous results. Often it is a result of strong army influence insisting on dedicated air cover. The result has always been insufficient cover to ALL the army formations, since the JGs, which did not have a penetration in their area, could not reinforce the area where the intrusion actually took place. In this particular case insufficiently trained forces possibly in inferior numbers were employed. This CONOPS was probably conceived under heavy influence by the commander of II JK since 15 October 1944 Gen.Maj. Dietrich Peltz, who also came under heavy criticism during the "Mutiny of the Aces" meeting with Göring 22 January 1945. It is noteworthy that this was the same CONOPS used in France for the employment of KG 51 and SKG 10 in Wilde Sau operations. In the winter 1944 - 1945 several organizational changes took place in order to adjust to the rapidly changing situation on the ground. Please see: http://www.gyges.dk/Luftwaffe%20organization%20A3%20post%208.pdf and http://www.gyges.dk/Luftwaffe%20organization%20A3%20colapse%202.pdf . Map of JG 2, 26 and 27 airfields and Jagdraume.